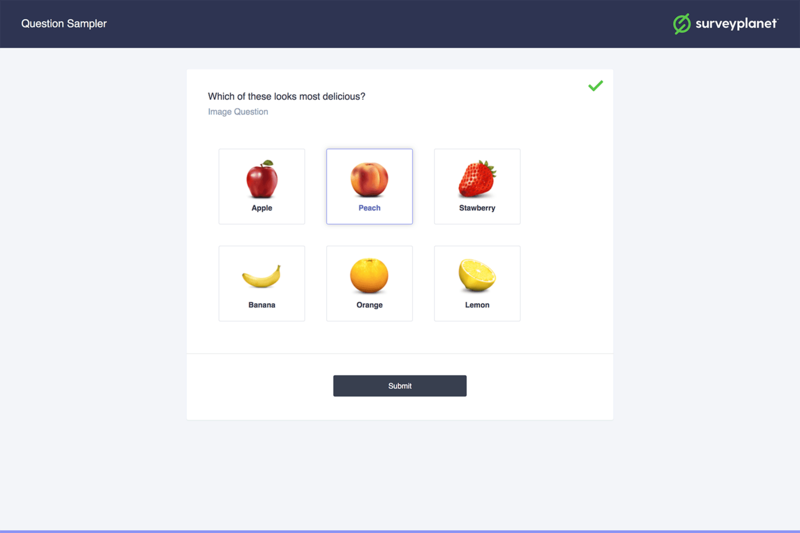 SurveyPlanet Pro users have access to a tenth question type, the Image Choice question. Image choice questions are like multiple choice questions, but they use images for the choices instead of text. To add an image and its label, click the purple Add Image button. You can then either choose an image that you’ve already uploaded or upload a new image. After you have selected an image, you can label it in the image choice input field. By default images are labeled Image 1, Image 2, Image 3 and so on, but you can click on the label to change it to whatever you would like. To remove an image, hover over the image choice box until the gray X appears on the right side. Click on the X to remove the image. To reorder your images, hover over the image you would like to move. Click and hold the Move icon on the right side of the box and drag the choice to its new location. You can have your uploaded images display in three different sizes: small, medium and large. Select a size in the Image Size drop down box. If you don’t want your survey respondents to see the image captions, check the Hide Captions checkbox to keep the captions from appearing in your survey. If you would like your survey participants to be able to select multiple images, check the Select Multiple checkbox. If you check this box, you must enter a minimum and maximum amount of images the survey participant can choose. When you select the Select Multiple checkbox, new options show up for a minimum and maximum amount of selections. Enter the minimum amount of selections you want to require your survey participants to choose in the Min box. When you select the Select Multiple checkbox, new options show up for a minimum and maximum amount of selections. Enter the maximum amount of selections you want to require your survey participants to choose in the Max box. Randomizing the image order means that the images will appear in a different order for each participant. This also means that they will usually appear in a different order from the order that you originally added them to your question. To have your choices appear in a random order, select the Random Order checkbox.